At first glance, Thomas Chimes’ 1989 painting Messenger might appear to be an abstract monochromatic canvas. 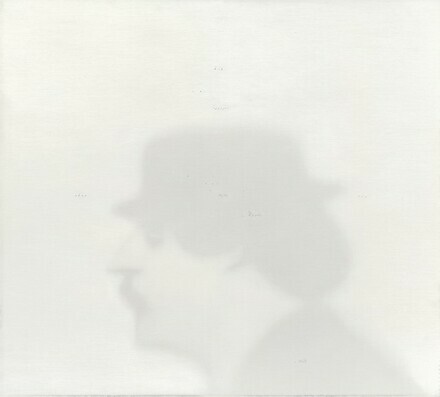 Slowly, though, a hazy profile emerges from the white field. Tiny words dot the canvas and skim the bottom edge. This mysterious painting begs to be deciphered. Chimes’ work has been described as hermetic. He was fascinated with mythology, alchemy, and the French poet and playwright Alfred Jarry (1873–1907). The head in Messenger comes from an 1897 photograph of Jarry on his new Clément Luxe 96 bicycle, which he was famous for riding. In the early 1980s, Chimes began inserting this image into landscape paintings. He replaced the bicycle, however, with two oars and transformed the writer into one of his characters, Dr. Faustroll, who traversed Paris in a skiff. In 1984, Chimes began a series of Faustroll paintings (Messenger, for one) in which the artist cropped away the body and drained his palette of color, using only titanium white and Mars black. The layers of white paint that veil the photo-based image also seem to blast it with light. That whiteness may suggest "emerging consciousness,” as Chimes said, or perhaps inner illumination. Two quotations (one in French, one in Greek) are carved into the paint at the bottom edge of the canvas. The first, translated from Jarry’s Exploits and Opinions of Doctor Faustroll, Pataphysician, reads, “God is the tangential point of zero and the infinite. Pataphysics is the science.” The second, in translation, is a query, “Why speak of manifold matter, [when] one substance is nature, and one nature conquers all?” This line is attributed to the Greek alchemical writer Zosimus, active in the third century AD, possibly quoting the pre-Socratic philosopher Democritus. Scattered around the canvas are the Greek words for messenger, air, fire, night, and water, and the names Maia and Hermes. What does it all mean? The painting raises questions about truth and nonsense, appearance and disappearance, clarity and obscurity. Born in 1921 in Philadelphia to Greek immigrant parents, Chimes studied briefly at the Pennsylvania Academy of the Fine Arts, then left to serve in World War II. In 1946 he settled in New York, where he studied philosophy at Columbia University and painting and sculpture at the Art Students League. He also met the artists Barnett Newman, Theodoros Stamos, and William Baziotes. Chimes moved back to Philadelphia in 1953. A great admirer of Thomas Eakins and Edgar Allan Poe, two Philadelphians who came before him, Chimes enjoyed a long career out of the limelight and developed his own vocabulary. In his sixties, Chimes took to wearing a porkpie hat and began to strongly resemble Jarry. Messenger, then, can also be read as a self-portrait. Acquired directly from the artist by (Locks Gallery, Philadelphia); gift 2009 to NGA. Thomas Chimes, Locks Gallery, Philadelphia, 1990, unnumbered catalogue, not mentioned. Thomas Chimes. Faustroll: Landscape, 1980-1990, Locks Gallery, Philadelphia, 2003, unnumbered catalogue, repro. The Big Nothing, Institute of Contemporary Art, Philadelphia, 2004, unnumbered catalogue, repro.